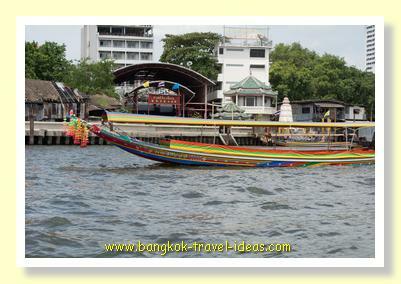 The plan was to take the Chaophraya River ferry to Nonthaburi on the second day. Leaving the Ramada Plaza Menam Riverside Hotel just before 10:00am we wandered back to the ferry pier next to Wat Ratcha Singkorn. The ferry boat was getting ready to depart and there were people just milling around. As the staff were still sweeping the decks we went to the small shop nearby and got a couple of drinks. By the time we got back to the pier passengers were already boarding the boat. You need to be nimble as to get onto the ferry we had to cross all the other boats first, hopping from one to the next. There were plenty of seats to choose from, so we sat towards the middle of the boat and knowing that the boat would turn in the other direction, chose the seats that would be out of the sun once we were under way. The other thing to consider when choosing where to sit on one of the Chaophraya River ferries is that near the front you may get splashed with water spray from the bow. Near the rear you will have to contend with the noise of the engine and a lot of people getting on and off. The rear can also get quite crowded. he ticket lady soon came around rattling her can and collected two 15 Baht fares from us and gave us the tickets. 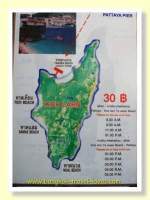 At the start of the trip it is easy for her to collect the money and know who hasn't paid, but later on when the boat filled up it would not be so easy. The first stop was Saphan Taksin pier and quite a lot of passengers got on board and pretty much all the seats were taken up right away. 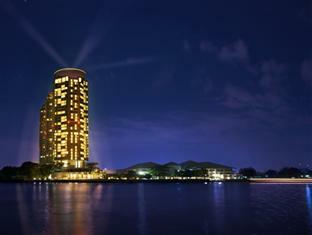 The ferry boat from the Shangri-La Hotel slid quietly by as the boat started to arrive at the pier. Most of the passengers boarding the ferry were Thais, but there were a few tourists as well. 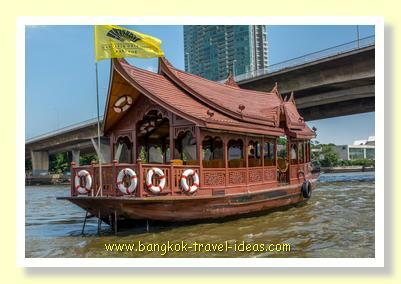 The tourists not in the know would be taking the Chao Phraya tourist boat for 250 Baht. 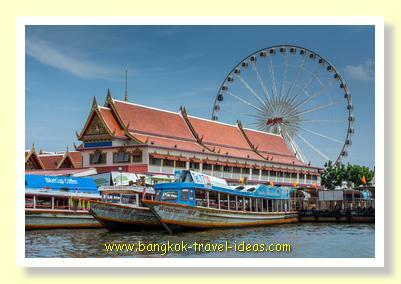 The only difference between that boat and the public ferry is that they announce the Bangkok attractions in English at each pier as the boat arrives. So if you have planned ahead and know which pier number to get off then you can save yourself a bit of money. The ferry boat continued on its way criss-crossing the Chaophraya River stopping at all of the tourist attractions. Altogether it took about 1 hour 15 minutes to reach the terminal pier at Nonthaburi. 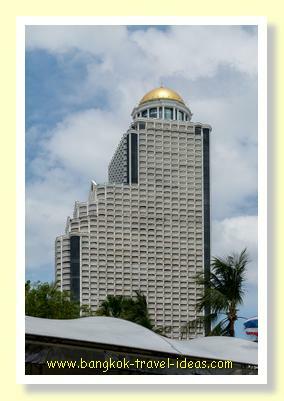 We got off the ferry to Nonthaburi and walked down Pracharat Road for about 500 metres. The street was really busy with buses and traffic and there were small stalls along the pavement selling buns and Buddha images. As we wandered around I spotted the once familiar sight of a Sarmlor. 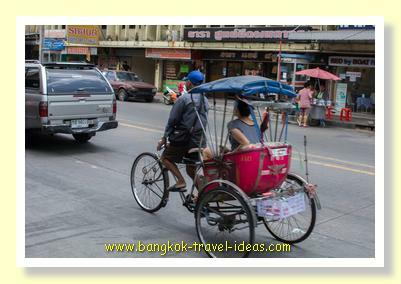 These are the three wheeled tricycles that used to be abundant in Bangkok town, but have nearly all been replaced by motorised vehicles. I managed to capture a photograph as the guy slipped by me. We didn't have a map of the town and didn't have any plan to visit any place special in Nonthaburi so after about 20 minutes of walking we found a noodle shop for some lunch and had a bite to eat. 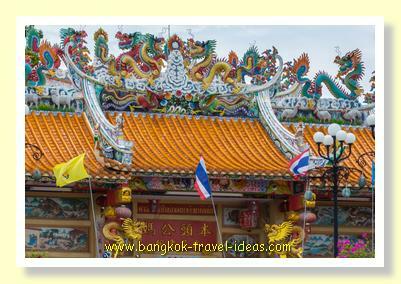 There is nothing really remarkable about this area of Bangkok. 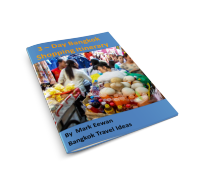 But the ferry terminal is only a few hundred metres from the infamous Bang Kwang Prison, which is still sometimes dubbed the Bangkok Hilton by the popular media after the Australian mini-series of the same name. 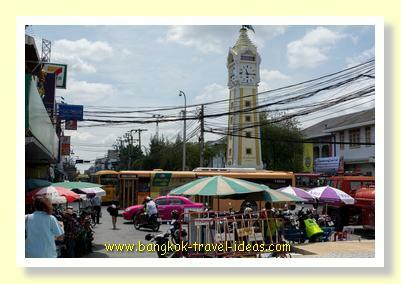 After paying for the lunch we crossed to the other side of the street and started to walk back to the Nonthaburi pier. 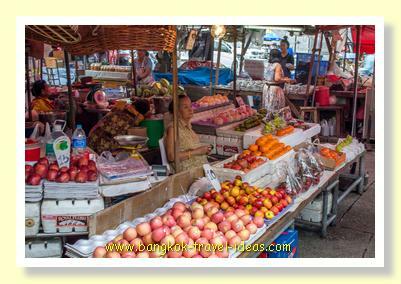 On this side of the road there was a small fruit market, some gold shops and various other stalls. The sun was out and it was fairly hot so we stayed in the shade as much as possible. Back at the pier we had to pay the lady at the desk before we got on the ferry. The trip back along the river was another great opportunity to take photos of the riverside and gives a different viewpoint than from the land. 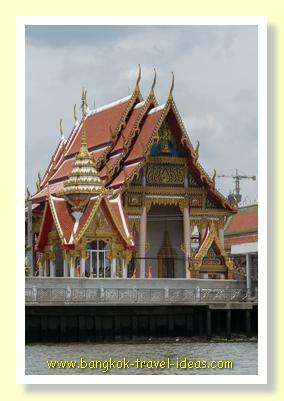 As the boat departed the pier I saw a large Chinese temple that looked interesting and as we went back down the river there was the power station that generates power for Bangkok. There were many Buddhist temples dotted along the way; too many to know the names for. It was still early afternoon, but by now the ferry boat was absolutely packed with tourists and schoolchildren coming out of school. 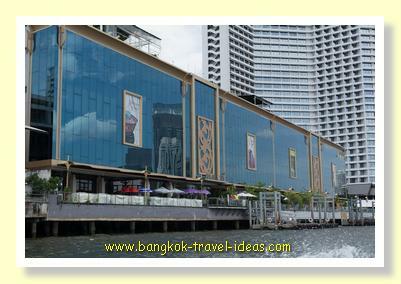 As we approached the Khao San Road area then the familiar Navalai River Resort appeared. If you need to be in close to the Khao San Road or Banglamphu area then this is quite convenient. 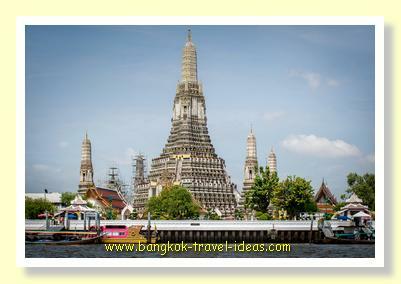 Beyond this pier were the famous tourist attractions of Wat Arun and the shopping area of River City Palace. 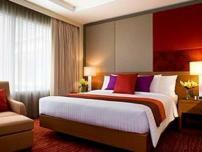 Next were the popular Chinatown area and the upmarket Le Bua Hotel. If you are looking for a special evening out, the Le Bua Sky Bar is the place to be as it has a commanding view over the river. 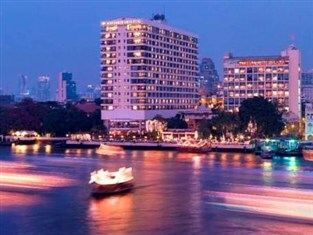 The Chaophraya River ferry continued until we passed the Shangri-La Hotel. I could see their outdoor restaurant area and remembered watching a great firework display many years ago from the outdoors Sala Thip restaurant. 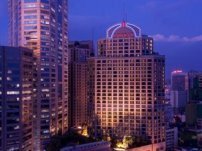 The Shangri-La Hotel makes a great base location for visitors to Bangkok, as it is directly on the BTS line and also has river access. 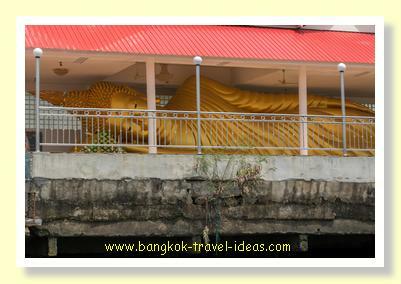 A little bit further on and just beyond the Saphan Taksin pier there was a large reclining Buddha image at Wat Yannawa before passing the Ramada Plaza Menam Riverside Hotel. We knew we were nearly home when we could see the large Asiatique Ferris Wheel. Even though this was supposed to be the Bangkok rainy season, the weather had held up pretty well on or ferry boat ride on the Chao Phraya River. It was now time to head off over to the swimming pool again.